Welcome to the R1b All Subclades Master Project and Gateway! R1b is the paternal branch of the human family tree marked by the mutation M343+. R1b includes all R-M269 people. If you are R1b of any type, including predicted M343+, P25+, M269+ or of any descendant SNP such as U106+, P312+, L21+, DF27+, U152+, S1194+, Z2103+ or V88+; please join this project. R1b-M343 is the most common Y haplogroup of men across Europe and the Americas. R1b is diverse as it expanded explosively in the Bronze Age. This means it is important to know which major subclade you belong to and join that sub-project. The goals of the R1b All Subclades Master Project and Gateway are to gain deeper understanding of the origins and migrations of our ancient lineages while helping you find family paternal lineages, relationships and recent origins. We support DNA testing steps that will identify where you fit within R1b and join you to the right subclade project. This is called the gateway service. The project administrators automatically add members to the appropriate R1b subclade project as test results dictate. This project is only for R1b people who are willing to be added to the appropriate subclade projects. The largest subclades projects are the P312, U106, L21, M222, DF27, U152, and R1b Basal (M343+ P312- U106- early/basal branches) projects. Detailed information on these subclades is available on the ABOUT/RESULTS page. As you test SNPs and are classified into major subclades, please stay in the R1b project as a role model. We need people who have tested deeply to be included in the R1b Haplotypes comparisons so new people can learn what testing they might consider. The best role models are those with Big Y500. It is a benefit to you to stay so more people can more easily find you. You can see your ancient subclade mates in this project where FTDNA matching leaves off. Make sure to review the ABOUT/RESULTS project page to see the tree, maps and related research. 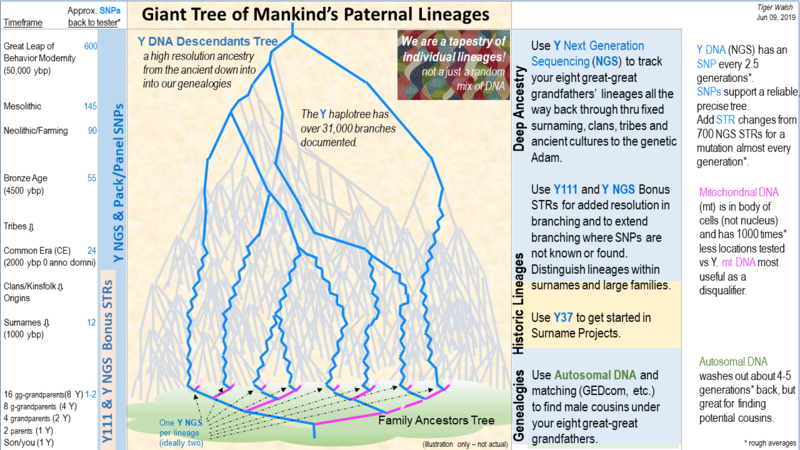 Discovering the giant family tree of paternal lineages is an important task for this project. This will help us understand the origins of R1b as a whole, at the subclade levels and down to the genealogical family tree level. 6. Move forward with an Single-Nucleotide Polymorphism (SNP) testing plan so your subclade can be identified and haplogroup updated. Evaluating matches at 67 or 111 STRs can be very helpful. Clear patterns or STR signatures among your best matches may help you decide what SNPs or SNP Packs to buy. This project's Activity Feed as well as the R1b-YDNA yahoo group are setup to help you evaluate testing plans. Even if you don't have matches on myFTDNA, the projects R1b-GOLD_Haplotypes spreadsheet can be helpful in identifying signature STRs for more efficient SNP testing. 6B. The R1b-M343 & M269 Backbone SNP Pack is a cost effective option that gives you very good coverage of the large branches of R1b. It can place you in the appropriate major subclades of R1b. You can order it from your FTDNA account. If you don't see the option, please check the blue UPGRADES button, then the BUY NOW button in the ADVANCED TESTS box, and pick SNP PACK in the SELECT A PRODUCT box. Please post on the R1b-YDNA yahoo group if you have questions. If you have a true interest in genetic genealogy and breaking beyond the brickwalls of your genealogical records, please strongly consider Big Y500 to determine your haplogroup down to a very recent timeframe so that you can refine your close-in family and surname mutation history tree. Y111 is included in Big Y500. This is a public project. The more of us who test and share our information, the more we will all know. When you join you're making surname, ancestor and DNA related results public, from which they can never be fully retracted. Please remove yourself if you don't want to share publicly. We do not publish your full given name or contact info. Results information is shared across the R1b All Subclades project and major R1b Subclades projects. Single-Nucleotide Polymorphisms (SNPs) are very stables, mutating rarely. Most European R1b paternal lineages are related within the last several thousand years. That means that R1b STR based haplotypes often look alike. The most common pattern of Y STRs is the Western Atlantic Modal Haplotype (WAMH). Most R1b people match several components of it. It is just a remnant of the fact we are closely related. SNPs differentiate the branches of R1b’s descendants tree. An simplified, overview version is on this project's ABOUT/OVERVIEW web page. R1b itself, the trunk of our tree, is marked by the SNP M343. We all are M343+ since it was present in our common ancestor, a single prehistoric man. There are now thousands of known branches on the R1b tree. Many of these branches have coincidentally matching Y STRs. In other words, their branches appear to cross. This gives us false matches. This is definitely a problem with limited haplotypes of Y12 and Y25 STR markers. Getting up to Y37 helps, as does Y67, but Y111 is much more helpful and the new standard. SNPs are more stable markers for our paternal lineages. They are nearly permanent throughout eternity so reliably our branching of paternal lineages. The number of SNPs available for testing is growing as more and more advanced testing is developed. You will want to identify your terminal SNP, which is the youngest SNP mutation that you have, that is on a formal Y DNA tree. Your terminal SNP tells you where you fit from a deep ancestral perspective. What is a Terminal SNP or haplogroup? Public and Private SNPs?